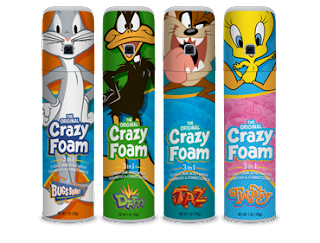 Crazy Foam first appeared at bath time in 1965, manufactured by the American Aerosol Company. Released with a variety of characters both licensed and generic. The "Fun Foam Soap" made bath time more creative and interactive for kids. Combining a way to get clean with the novelty of playing with their favorite characters. Now, Crazy Foam arises from the foamy depths of the drain to make bath time fun once again. Bigger and better with a larger can and features an easily accessible button. The new Crazy Foam combines bodywash, shampoo, and conditioner. Still the fun foam we all know. Crazy Foam is so much fun! I think I remember having some of this as a kid for bath time and it was so much fun. I love that Crazy Foam is a body wash, shampoo, and conditioner all in one making bath time for kids as easy as can be. My kids had such a blast with Crazy Foam! They loved making foam hats in the bath with Crazy Foam and then enjoyed washing their own hair. I also loved that their hair was so easy to brush afterwards. I have three girls with long hair so the hair brushing struggle is real in my house. They also loved to wash their bodies with the foam and thanks to Crazy Foam are probably the cleanest kids on the block. Crazy Foam is the perfect gift for kids this holiday season. Not only is it so much fun but they come in so many fun characters! Click HERE to learn more about Crazy Foam! Follow Crazy Foam on social media! 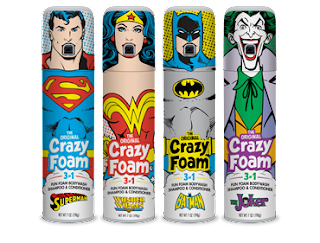 I've never heard of crazy foam, but it sounds like something my nieces would like! My son would LOVE this! I remember playing with it as a kid. I didn't even realize it was still around. Oh how fun! The kids would think this is a scream! I've never heard of Crazy Foam but my kids will enjoy it. This seems fun. My son would go crazy for the Batman. Now I want to take a bath. My nephew would love the Batman foam. Looks like a lot of fun! My son would love this! Haha I remember using this as a kid! I am sure my kids would have a ball with this! I know my nieces and nephews would love this. My kids who are teenagers make like it too. I know my silly self would probably play with it. 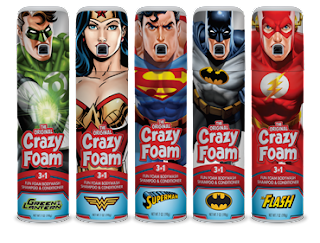 I am lovin' the package design of the Wonder Woman Justice League foam…it's just calling out my name. This looks like a fun product to use. I love bath time with my kids. So glad I have been able to take it back over. I can't believe Crazy Foam has been around for so long! I bet my kids would get a kick out of it-- not that bathtime is a struggle here, they all love it! Nice review on crazy foam! Thanks for sharing! I love crazy foam. Used to have this as a kid, and I know my kids would love this. Thanks for your review! My son would love almost all these characters! What a great holiday gift. Ah how fun! I don't think I've seen this, but we're always looking for fun bathtime stuff! I think I had this stuff when I was a kid! So fun!